On Wednesday, July 21, 2010, the Government Management, Organization and Procurement Subcommittee held a hearing to examine to what extent the federal government has incorporated green, high-performance building practices into the renovation and construction of existing and new U.S. government owned and leased buildings in accordance with the Energy Independence and security Act of 2007 (EISA), and Executive Order 13514 and other relevant statutes and directives. Kevin Kampschroer, Director of the Office of Federal High-Performance Green Buildings (OFHPGB) at the United States General Services Administration (GSA). 5. Water conservation projects In addition, GSA has worked to establish geothermal and lighting technology acceleration programs. • Moving the overall market conditions toward higher performance, through the Federal demand for sustainable facilities. • Strategic Sustainability Performance Planning. EPA occupies 11 million square feet (SF) of office, support and laboratory space across the country, which houses over 17,000 federal employees and 8,000 support personnel. An area that is having a growing impact on our green building efforts is building operations and maintenance. Buildings designed to be energy efficient are frequently complex to operate and maintain. Locating and retaining qualified, competent and experienced building operators is becoming increasingly difficult, leading to inefficient and ineffective facility operations in certain locations. EPA is using EISA required energy assessments and re-commissioning to identify and correct poor preventative maintenance practices, improve mechanical system operating efficiency, and evaluate O and M contractor performance. EPA believes that EISA Sec 432 implementing guidance setting minimum training requirements for federal Energy Managers also should improve O and M at EPA and other federal facilities. EPA has also developed a Building Management Program to improve and standardize facility O&M best practices at all EPA-owned facilities. Several tools that EPA developed include the Portfolio Manager and Target Finder, two on-line energy management tracking and assessment tools. Portfolio Manager is being used by 15 billion SF of commercial building market (20% of the market) to track energy and water usage, assess the performance of buildings, set goals and make reductions across building portfolios. http://www.energystar.gov/ia/business/downloads/ENERGY_STAR_Snapshot_Spring_2010.pdf Recently, as part of a joint effort between EPA, DOE and GSA, EPA expanded Portfolio Manager to include the Federal Sustainability Checklist, allowing federal agencies to track and report their progress on the sustainability goals required as part of Executive Order 13514. EPA’s ENERGY STAR Program is also providing training to federal agencies as part of this collaboration. In recognition of the unique position of the Institute, the Energy Policy Act of 2005 (EPAct) called for the establishment of a High-Performance Building Council within the Institute tasked to look at the diversity of codes and standards for buildings and determine the needs necessary for implementation of high-performance buildings. As its initial task, the Council identified the eight attributes that define a high-performance building. They are:  Sustainability Cost Effectiveness Accessibility Productivity Historic Preservation Aesthetics Functionality Safety and Security These attributes are reflected in the definitions of High-Performance Building and High-Performance Green Building as defined in the Energy Independence and Security Act of 2007 (EISA) which defines high performance as “the integration and optimization on a life cycle basis of all major high performance attributes, including energy conservation, environment, safety, security, durability, accessibility, cost-benefit, productivity, sustainability, functionality, and operational considerations.” As the Subcommittee will note, sustainability or “green” is just one aspect of a high-performance building. Federal agencies have numerous requirements related to these high-performance attributes beyond the energy, water and sustainability requirements in EPAct, EISA, and Executive Orders 13423 and 13514. Additionally, these requirements are likely to expand and change due to emerging issues impacting building occupancy and use including those tied to our aging population (e.g., addressing low vision) and to increased interest in technology and sustainability (e.g., flexibility for new technologies and new work environments). A sample of relevant laws and Executive Orders appear below: Americans with Disabilities Act National Historic Preservation Act Public Buildings Act National Environmental Policy Act E.O. 13006: Historic Properties E.O. 12977: Security Standards E.O. 12941/12699: Seismic Safety Presidential Memorandum on Disposing of Unneeded Federal Real-Estate (June 10, 2010). As the High-Performance Building Council reported, common metrics are needed to measure and compare achievement of individual attributes and then to understand the interactions across attributes. EESI is a nonprofit policy-education organization dedicated to developing innovative solutions to climate change and other critical energy and environmental challenges and bringing sound science and technology information to policymakers through briefings, publications and other activities. Founded by members of a bi-partisan Congressional study conference, EESI has been an independent organization since 1984 1984 and is funded primarily through foundation grants and charitable contributions. The federal government owns and operates nearly 500,000 facilities and can establish its own performance goals, above and beyond what Congress has already required. With about 3 billion square feet of floor space, federal buildings have a substantial environmental footprint, consuming 1.6 percent of the nation’s total energy use at an annual cost of $24.5 billion, according to the Federal Energy Management Program (FEMP). The terms high performance and green have evolved substantially over the years. We are grateful that your committee in Section 401 of the Energy Independence and Security Act of 2007 defined high performance green buildings for the purposes of the activities of the Department of Energy and General Services Administration in a way that captures best current thinking. 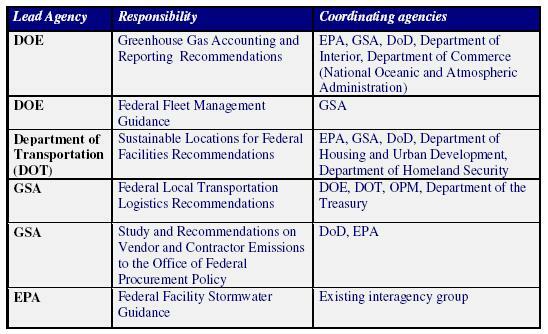 These definitions challenge the government to design, construct, and operate its buildings at the state of the art and pave the way for these agencies to show leadership over the next two decades, a period during which we will need higher performance from federal and other buildings than ever before. Retrofit is very important because new construction adds only a very small percentage to our national building inventory each year. Therefore, if we are to have a significant number of high performance green buildings in our lifetimes, much of the work will have to be retrofits of existing buildings. Standard 90.1 now serves as both the federal building standard, and the national reference for state adopted commercial building codes through the Energy Independence and Security Act (EISA), the Energy Conservation and Production Act (ECPA), and the Energy Policy Act of 2005 (EPAct). The impact of our nation’s buildings is surprisingly large. Our nation’s buildings account for 40 percent of our primary energy use—more than either transportation or industry. Buildings are responsible for 72 percent of the electricity consumption and 39 percent of the total U.S. carbon dioxide emissions. The CO2 emissions from US buildings alone approximately equal the combined emissions of Japan, France, and the United Kingdom for transportation, industry, and buildings. My presidential theme is “Modeling a Sustainable World.” Building modeling represents one of the most powerful tools for optimizing building performance, and it is an area worthy of increased support from Congress. Today, we have the tools to create a virtual model to consider options in size, shape and appearance. But more than just a visual representation, our models can simulate energy performance, assess daylighting options and predict thermal comfort. To exploit the full capability of modeling tools, we must transform our design approach from a sequential process — where one discipline completes its work and hands off the design to the next — to a collaborative integrated building design process — where all of the disciplines involved in the building design and construction work as team from the beginning to evaluate options and optimize the design. Our biggest challenge is implementing integrated design into daily practice. The traditional sequential approach misses the rich opportunities for optimizing building performance through a collaborative approach throughout the design process. It is going to require a cultural shift in our industry to transform the design process, and it’s a shift that has to occur if we are going to reach our goal of net zero energy buildings. To help expand awareness throughout the federal government of the potential benefits of increased energy savings that can be achieved through integrated, whole building design, we recommend creating a new demonstration program with selected, geographically diverse federal buildings. A report on the success and challenges of such a demonstration program would yield useful lessons learned that could be applied and expanded to other federal buildings, as well as buildings in the private sector. Standard 189.1: A New Foundation for Green Building Standards Earlier this year, in our continuing efforts to push the envelope on building efficiency, and in collaboration with the Illuminating Engineering Society of North America (IES) and the U.S. Green Building Council (USGBC), ASHRAE published Standard 189.1 – the first code-intended commercial green building standard in the United States. Standard 189.1 also serves as a compliance path of the International Green Construction Code (IGCC), published by the International Code Council. Standard 189.1 represents a revolutionary new step for building standards, as it provides a long-needed green building foundation for those who strive to design, build and operate green buildings. From site location to energy use to recycling, this standard will set the foundation for green buildings through its adoption into local codes. It covers key topic areas similar to green building rating systems, including site sustainability, water use efficiency, energy efficiency, indoor environmental quality and the building’s impact on the atmosphere, materials and resources. applied and expanded to other federal buildings, as well as buildings in the private sector. Today, air conditioning use alone represents nearly 13% of all U.S. electricity consumption! On the residential air conditioning side, the consumption rate is already at 17% and will grow to 19% by 2030. Furthermore, the Electric Power Research Institute (EPRI) is forecasting that consumers in the United States will increase their use of electricity by 1.4% annually through 2030. This data already accounts for the energy-efficiency legislation enacted that will impact future consumption. With energy consumption on the rise and the associated implications the increases will bring, it’s an issue both government and industry can not afford to ignore. The Leader in Construction Cost Estimating and Project Management software for the DOD and Federal Sector. Commercial buildings in the U.S. used a total of approximately 5.7 quadrillion Btu of all major fuels (electricity, natural gas, fuel oil, and district steam or hot water) in 1999. Office buildings used the most total energy of all the building types, which was not a surprise since they were the most common commercial building type and had an above average energy intensity. Because there were relatively few inpatient health care buildings and they tend to be large, energy intensive buildings, their energy consumption per building was far above that of any other building type. Buildings types that are more likely to contain specialized, high energy-consuming equipment—food service (cooking and ventilation equipment), inpatient health care (medical equipment), and food sales (refrigeration)—were the most energy-intensive types, all using at least twice as much energy per square foot as the average commercial building. When the hours of building operation were taken into account, building types that are characterized by long working hours had a lower energy intensity than those that are normally used for shorter periods of time. Inpatient health, which used the most energy per square foot, became relatively less intensive when operating hours were taken into account, since hospitals are typically open around the clock. Education buildings, on the other hand, which are in use for shorter periods of time, become relatively more intensive than when looking just at energy use per square foot. he Energy Information Administration conducts the Commercial Buildings Energy Consumption Survey (CBECS) to collect information on energy-related building characteristics and types and amounts of energy consumed in commercial buildings in the United States. The CBECS is a national-level sample survey conducted quadrennially of buildings greater than 1,000 square feet in size that devote more than 50 percent of their floorspace to commercial activity. The 2003 CBECS, the eighth in the series begun in 1979, is significant because it was conducted using a completely new sample frame, the list of buildings from which the buildings to be surveyed were selected. See Sample Design and Technical Information on CBECS for additional information about the 2003 survey. Figure 1. Electricity accounts for more than half of energy consumed by commercial buildings. Source: Energy Information Administration, 2003 Commercial Buildings Energy Consumption Survey, Table C1A. Figure 2. More than half of energy consumed in commercial buildings is used for space heating and lighting. 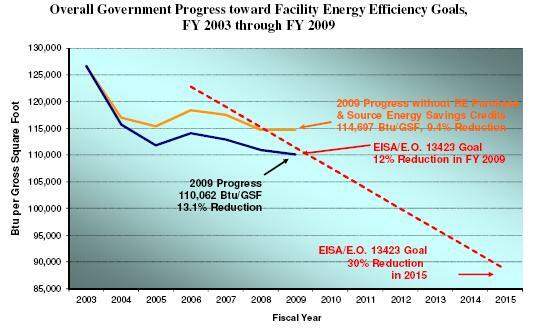 Source: Energy Information Administration, 2003 Commercial Buildings Energy Consumption Survey, Table E1A. 1 Commercial Building Energy Consumption Survey (CBECS), conducted in 2003, was used to calculate values presented in this table. The data is gathered from the Dept. of Energy’s – Energy Information Administration (EIA). 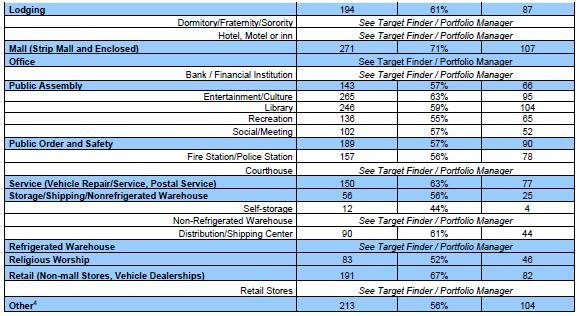 These are building types that are not currently available in EPA’s Portfolio Manager or Target Finder tools. Please note all source and site EUI values displayed are annual figures. Source energy value are calculated using a conversion factor for electricity of 1 kBtu site energy = 3.34 kBtu source energy; a conversion factor for natural gas of 1 kBtu site energy = 1.047 kBtu source energy; a conversion factor for district heat of 1 kbtu site energy = 1.40 source energy; and a conversion factor for fuel oil of 1 kbtu site energy = 1.01. Explanation of Source Energy: The source energy intensity target cannot simply be converted into an equivalent site energy value because different design strategies may yield different fuel mixes. Thus the different fuel mixes translate into the corresponding site to source ratios for a specific building. It is important to note that reducing source energy by 50% is not always mathematically equivalent to reducing site energy by 50%. For the most equitable peer comparison, the associated fuel mix should be used to convert the modeled site energy into the total source energy. The source energy use can then be compared to the values in this table. 4Other: For all building types not defined by the list above, these buildings may choose to use the performance benchmark categorized by “other”. Note that this category is not well defined therefore source energy use varies greatly with source EUI ranging over 1500 kBtu/sqft. As categorized by EIA, “other” may include airplane hangers, laboratory, crematorium, data center, etc. the percent of similar buildings in the nation or region less efficient than yours. via Buildings Technology Center–Building Design and Performance Program. 1Regional “close-to-home” distribution provided for this building type. National distributions provided for others. Created and maintained by the Buildings Technology Center at Oak Ridge National Laboratory. We are grateful to the states of Iowa, Colorado, Florida, Vermont, and the Asia-Pacific countries who shared energy use and cost data on their buildings and industrial facilities. Initial research sponsored by the U.S. Department of Energy’s Buildings Technology Program. The U.S. Department of Energy’s (DOE) Building Technologies Program is offering a Webinar on Tuesday, February 16, 2010, from 12:00-1:30 p.m. EST titled “Going With the Flow: Designing High-Performance Buildings with EnergyPlus.” The DOE gives builders and architects the tools to predict energy flows in commercial and residential buildings—before construction—with EnergyPlus™ software. EnergyPlus, DOE’s fully integrated building, HVAC, and renewable energy simulation program, models building heating, cooling, lighting, ventilating, and other energy flows, as well as water. OpenStudio, DOE’s free plugin for the Google SketchUp 3D drawing program, makes it easy to create and edit the building geometry in EnergyPlus input files or launch EnergyPlus simulations and view the results in SketchUp. This Webinar will focus on the importance of precise energy simulations in the drive for high-performance buildings, and will provide an overview of the features and capabilities of EnergyPlus software and the OpenStudio plugin. Target Audience: Architects, engineers, builders. Presenter: Dru Crawley, Ph.D., Commercial Buildings Team Lead, Building Technologies Program, U.S. Department of Energy. To facilitate energy-smart design of high-performance buildings, DOE gives builders and architects the tools to predict energy flows in commercial and residential buildings—before construction—with EnergyPlus™ software. EnergyPlus, DOE’s fully integrated building, HVAC, and renewable energy simulation program, models building heating, cooling, lighting, ventilating, and other energy flows, as well as water. The program includes many innovative simulation capabilities, such as time steps of less than an hour, modular systems and plant integrated with heat balance-based zone simulation, multizone air flow, thermal comfort, water use, natural ventilation, and photovoltaic systems. This Webinar is free of charge, but you must register in advance to obtain the URL and password for logging on via the Internet and the phone number to connect to the audio. Learn more about the Webinar. Visit the Buildings Technologies Program Web site for information about research and development of technologies and practices to achieve the goal of marketable net-zero energy commercial and residential buildings. via Environmental, Health and Safety News: Free DOE Webinar Designing High-Performance EnergyPlus™ Buildings. via EnergyPulse – Insight Analysis and Commentary on the Global Power Industry.